Spark Social SF – LMNOP Design Inc. This backyard hangout with an Americana vibe feels like an oasis from urban, industrial life in the heart of Mission Bay, giving the neighborhood a cool place to hang out and be outdoors together. After their successful SOMA StrEat Food Park, the Muela Family decided to open another lively food truck venue in Mission Bay—an area limited in its food options and growing in its residential capacity. LMNOP took on the full scope of Spark, from initial concept, brand strategy, and graphic identity through design development, project management, and construction. The Muela’s wanted to attract a range of users—from hip, young professionals to families with small children—and offer them a comfortable, casual neighborhood place to be outdoors together. To achieve this, LMNOP created a cozy backyard hangout with an Americana vibe that feels like an oasis from urban, industrial life. 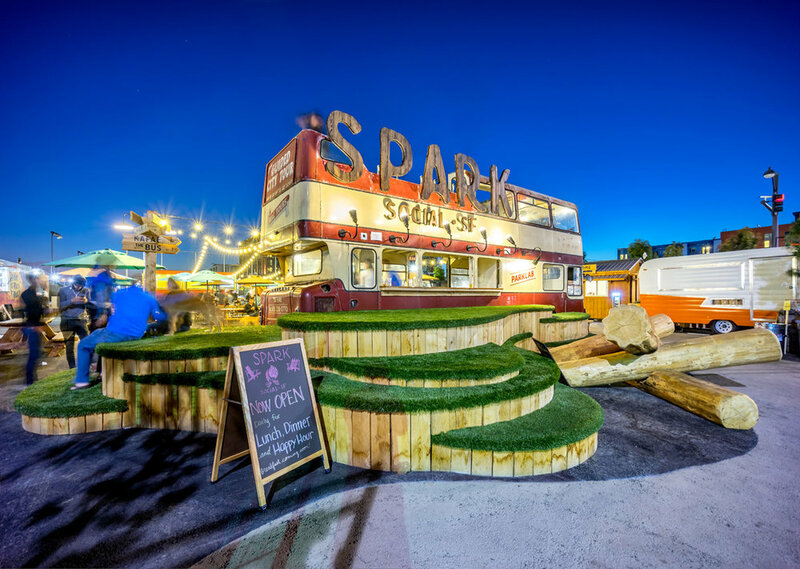 With a full bar and eight rotating food trucks, we also designed for extended evening use, incorporating four fire pits that have become so popular, they now have to be reserved in advance.